This volume, the first in a series devoted to the paleoanthropological resources of the Middle Awash Valley of Ethiopia, studies Homo erectus, a close relative of Homo sapiens. 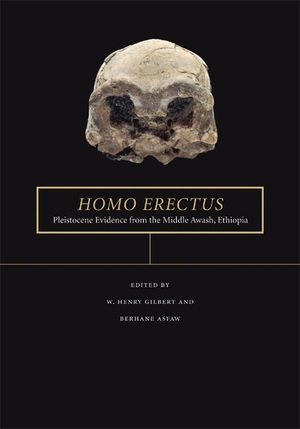 Written by a team of highly regarded scholars, this book provides the first detailed descriptions, photographs, and analysis of the fossil vertebrates—from elephants and hyenas to humans—from the Daka Member of the Bouri Formation of the Afar, a place renowned for an abundant and lengthy record of human ancestors. These fossils contribute to our understanding human evolution, and the associated fauna provide new information about the distribution and variability of Pleistocene mammals in eastern Africa. The contributors are all active researchers who worked on the paleontology and geology of these unique deposits. Here they have combined their disparate efforts into a single volume, making the original research results accessible to both the specialist and the general reader. The volume synthesizes environmental backdrop and anatomical detail to open an unparalleled window on the African Pleistocene and its inhabitants. W. Henry Gilbert is Assistant Professor of Anthropology at California State University, East Bay, and is Assistant Researcher at the Human Evolution Research Center, University of California, Berkeley. Berhane Asfaw is codirector of the Middle Awash research project and operates the Rift Valley Research Service in Addis Ababa, Ethiopia.